Georgia might be a small country but going from one place to another can be a bit of an adventure without your own car. Trains barely exist and public transportation, mainly minivans known as marshrutkas, can be painstakingly long. Direct routes can also be a stretch and as a result, many marshrutkas pass through the capital city when they could connect one city directly to the other. If you don’t have much time in the country, the good news is you can still make the most of Georgia’s diversity by basing yourself in Tbilisi. Quaint towns on top of hills, cave monasteries and church facing snow-capped mountains are just a couple hours away! Located a mere 20 minutes from Tbilisi, Mtskheta is the obvious day trip if you only have a few days in Georgia. The ancient capital of the Kingdom of Georgia has lost some of its glory and it can be hard to picture its past significance while walking through the streets of this really small town. However, Mtskheta hosts a national treasure that deserves a trip on its own merit: the Svetitskhoveli Cathedral, second largest church building in the country and World Heritage Site. 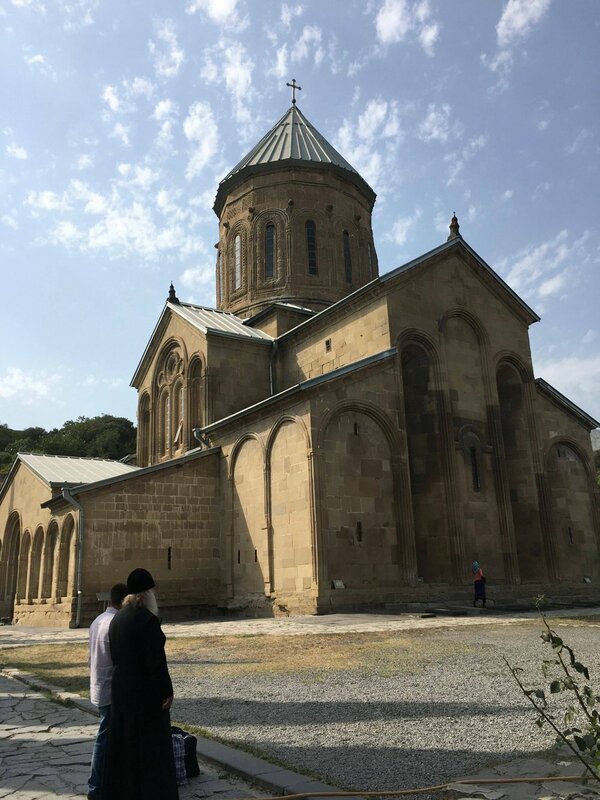 Despite its many visitors, many of which seem to be newly-wed couples, the church remains spiritually charged and a must visit to understand Georgia’s deep connection with Christianity. Walk further into the town and you will find the small Antioquia Church, still inhabited by nuns and an occasional cow grazing in the courtyard. Up north is also the less visited Samtavro church. Any visit to this historic town wouldn’t be complete either without a stop at the Jvari monastery, a sixth-century religious complex sitting on a mountaintop. How to get there: Marshrutkas leave the Didube station in northern Tbilisi every twenty to thirty minutes (1 lari per trip). No public transport goes to Jvari though, meaning you’ll have to hire a taxi (around 20 lari per roundtrip). Going back to Tbilisi is a different story since there isn’t a specific bus station Mtskheta. You can either hire a taxi or hail a marshrutka from the side of the road, never really knowing when one will arrive. Signs written in Georgian alphabet and restaurants selling khinkali aside, you could be fooled into thinking that you’re somewhere in Italy. Sighnaghi indeed gets compared a lot with a village in Tuscany, with its iconic church tower and fortification walls, although the mountains in the background remind you that you haven’t left Georgia. This town lost in time is a pleasant day trip away from the hustle of the city. Do not expect to find a lot of places to visit though, since Sighnaghi’s appeal is all about getting lost and soaking up the atmosphere. You won’t spend your day visiting museums then but rather you will befriend a cat in an empty alley, count the number of wine leaves in front of houses or stop in a park to indulge in fresh raspberries. A full day could be a bit much though, unless you want to visit the Kakheti region, in which case spending the night could allow for the visit of Telavi. You could also use the day to stop at the Davit Gareji cave monasteries but be aware that public transportation won’t take you this far, meaning you’d rather hire a private taxi for the day or book an organized tour. How to get there: marshrutkas leave from the Samgori station every two hours or so from 9AM and take about an hour and a half to reach Signaghi (6 lari per trip). Try to buy a ticket in advance for your return trip since the marshrutkas can get full pretty fast. Being in the heart of the Caucasus region, mountains are never too far away in Georgia. Being one of the first countries to convert to Christianity, if not the first, churches are never too far away either. If you combine both, you get the Gergeti Trinity Church in Kazbegi. Dramatically located on the top of a hill, right in front of snow-capped Mount Kazbegi, this church isn’t the most beautiful of all but it sure is the most picturesque. Climbing to the top makes the trip even more memorable, allowing for increasingly stunning views all the way, without being accessible to regular hikers only. 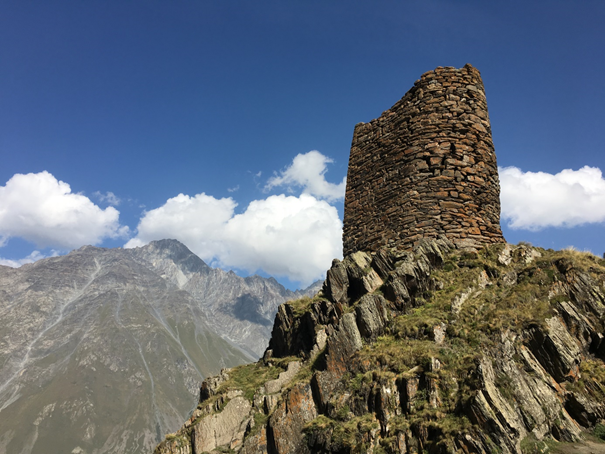 The hike takes about an hour and a half from the town of Kazbegi, otherwise known as Stepantsminda, but you can also hire a taxi to get there. An early departure and late return to Tbilisi can be enough to enjoy the place, even though it would be a very long day. If you’re planning to hike further than the Gergeti church, you will have to spend the night. How to get there: Marshrutkas leave the Didube station roughly every hour, taking about 3 hours to reach Kazbegi (10 lari per trip). Yet, these minivans do not work on a well-organized schedule, meaning they basically leave when full. Another option is to share a taxi with other travellers (approximately 20 lari per person), which gives the opportunity to visit the Ananuri monastery. On your way back, beware of the time since the latest marshrutka for Tbilisi leaves at 5:30PM. When it comes to monasteries, Georgia has its fair share of incredible scenery. Vardzia can definitely claim first place for the most impressive feat of architecture in the country. This cave monastery on the slopes of the Erusheti Mountain is thought to have been the home of Queen Tamar the Great in the 12th century, whose name resonates with the Georgian Golden Age. The many rooms chiselled into the rocks give it a distinct look, culminating in the Church of the Dormition that was carved in the rocks and decorated with vivid frescos. The site in itself only takes one or two hours to visit but you can easily pair it with a stop in the small town of Akhaltsikhe, known for its (heavily) reconstructed Ottoman fortress. One look will tell you that historical accuracy was not the main goal of the fortress’ renovation. Yet, when you put this behind you, the Rabati fortress is a charming place for a stroll and for a view. How to get there: Marshrutkas go to Akhaltsikhe from the Didube station every hour and take around two and a half hours (8 lari per trip). In Akhaltsikhe you will be able to get on a marshrutka to Vardzia at 10:30AM, 1PM and 3PM. 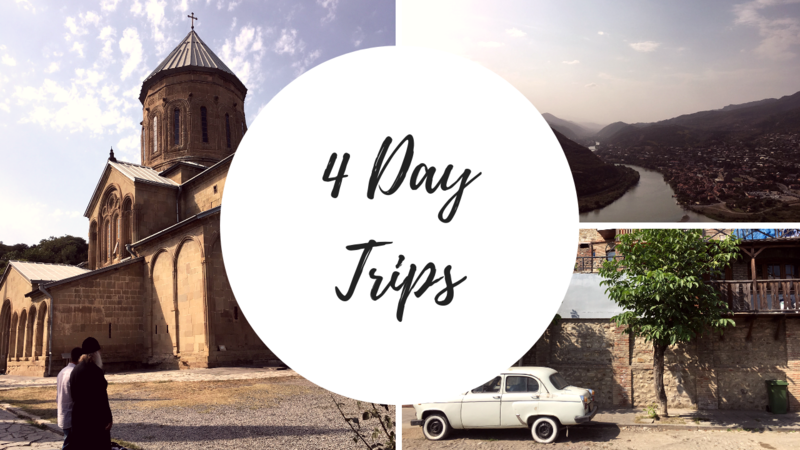 The schedule can be a bit tight though so you might want to consider taking part in an organized trip from Tbilisi (75 to 90 lari per person) or spend the night in neighbouring Borjomi, where organized tours depart every day (30 lari per person).